N. Grosvenordale – Theresa (Choquette) Krawiec, 86, of Buckley Hill Rd., died Thursday, October 18, 2012 in Regency Heights of Danielson. She was the loving wife of Peter Krawiec for 68 years. Born in N. Grosvenordale, she was the daughter of the late Albert and Aura (Beaulac) Choquette. Mrs. Krawiec worked as a spinner for Matson Mills. 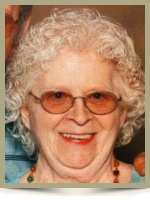 She enjoyed crocheting, gardening and fishing with her husband. She always loved spending time and knitting things for her grandchildren and great grandchildren. Mrs. Krawiec was a member of the American Legion Ladies Auxiliary, VFW Post 67 Ladies Auxiliary, and the former Vice President of the Eastern Connecticut Police Association. In addition to her husband, Theresa is survived by her daughter, Nancy Strouse and her husband Robert of Putnam; her grandchildren Jennifer (Dennis) Pierce, Louis (Erin) Bunker, Bonnie Falke, Daniel Bunker, and Brian (Ashley) Falke; and her great grandchildren, Jasmine Falke, Ariana Bunker, Emmalyn Bunker, Zachary Bunker, Hannah Pierce, Alliea Falke, and Justin Falke. She was predeceased by her daughter Jo Ann Pavone; her brothers, Lionel and Philip Choquette; and her sister Alice Smith. Relatives and friends are invited to visit with Theresa’s family from 6:00 pm to 8:00 pm, on Sunday, October 21, 2012 in the Valade Funeral Home, 23 Main St., N. Grosvenordale CT. A gathering will begin at 9:00 am on Monday, October 22, 2012, followed by a Mass of Christian Burial at 10:00 am in St. Joseph Church, 18 Main St., N. Grosvenordale. Burial will follow in St. Joseph Cemetery. Memorial donations may be made to St. Joseph School, 26 North Main St., N. Grosvenordale. For memorial guestbook visit www.GilmanAndValade.com. Condolences to Nancy and your family, and to Uncle Walter. I am at the other end of the world here but if there is anything I can do just let me know.